In the latest episode of my podcast, I interviewed a man, “Expat,” about some of the claims of another man, Mike Bara. In setting up the interview with Expat, I agreed to limit the scope of the interview to just cover his call into the show and very closely related claims. However, during Mike Bara’s interview on Coast to Coast AM on November 10, 2010, he made many many basic science claims, errors, and outright pseudoscience statements. On this “Baraversary” of his interview on Coast to Coast, I wanted to delve a little more in-depth into some of his other claims. So you can see that I’m not being unfair in my painting of him as a new-ager nor a conspiracist. He also looks kinda badass in his photo, like he’d be at home on a noisy motorcycle — much cooler than I do. This is a totally irrelevant point, but since I rarely talk specifically about a person, I thought I’d bring it up in the rare case when I do. The next several sections are my attempt to organize the basic statements made by him during his Nov. 10, 2010, C2C interview. But perhaps I’m closed-minded about hyperdimensional physics because I don’t believe in God. Bara states at 21:47 in hour two, “[Scientists] don’t want to admit that there’s a god, and that’s another reason why hyperdimensional physics is not accepted.” Um … sure. Not. And auras and crystals and consciousness. He believes in all that, clearly explicitly states it, but I want to focus in this section more on the astrology (though this will be short). I’ve written quite a bit about astrology before. If interested in the short version, I recommend this post first. If interested in reading more, I recommend this post second. Or, if you’d rather listen, I can now link you to my podcast episode on astrology (ep. 6 for those who already subscribe but want to re-listen). There are several important things to note here. First, this was not peer-reviewed meaning that there was no external unbiased rigorous check of his work. Second, correlation does not equal causation. Third, this was a single study, and even if 100% true and valid, it has not been replicated by anyone else that I have been able to find (I searched for about a half hour). Fourth, it has not been used to actually make predictions, which all testable hypotheses must. At the absolute very least, one can conclusively state that this does not prove astrology affects our “consciousness.” And if this is the best evidence, well, that’s sad. It’s nice when one’s research involves going back into their own blog archives. In this case, for background in why the 2012 purported galactic alignment is not worth the electrons its printed on, I’ll refer you to this post of mine. With that out of the way, Bara stated during the second hour at 27:48 into the hour: “We do get hit by a pulse of energy from the center of the galaxy right around this December 21[, 2012] period, in fact it goes for about a month before and a month after that where we’re really in this energetic pulse from the center of the galaxy at this time.” Then he went on to say that the energy is neutral and we can choose whatever we want to come out of it and it’ll happen. (Did I mention that the tagline for his book, The Choice, is, “You’ve heard of The Secret, now you can make The Choice”?) He also states around 10 minutes into the third hour, “We are aligned with the center of the galaxy [around the winter solstice].” Again, see my post linked in the paragraph above. And he brings in astrology. See the section before this one. In addition to this other stuff, Bara is a fan of the idea “planets were given birth to by the sun, the sun spewed the plants out, kinda from her belly” (16:31 into hour 2). Because of this, the planets are connected, and all our woes today are because there are missing planets, “quite obviously” the missing one between Mars and Jupiter (“Planet V”), of which Mars used to be a moon. When you lose planets in the system, you have less life energy and the “system gets out of harmony.” As evidence, “What happens is the Earth is tilted off its vertical axis by about 23°, and that makes us vulnerable to different waves of energy that are created when different planetary geometries – that is, the orbits of the planets around the Earth affect what’s going on here, they affect physical instruments, things like pendulums, they swing backwards during eclipses” (starting at 18:46 into hour 2). So yeah, back to pendulums with a really really wonky idea of solar system / planetary formation, including the completely fallacious idea that the asteroid belt was once a planet and Mars was somehow its moon (“Mars itself which was absolutely devastated by … Planet V, the signatures are all over Mars” (18:20)). I actually do plan to go into the whole “exploding planet ‘hypothesis'” in some future blog post and likely in some future podcast episode, as well. For now, I hope that most people recognize that this is very hard to make happen by any known process, and the onus is on Mike Bara to really provide VERY convincing theory and evidence for why it’s the case. Yeah, I’m punting, but this is a LONG post. I’ll forgo scoring this one for now. Someone remind me when I do that future post to add a link here. Yeah, that’s right, instead of an extra term in Newtonian gravity or there being material out there that does not interact with light but does interact with other matter (that is the definition of dark matter), it’s God. It’s really difficult to know where to start here. So I won’t bother. I’ll refer you to wiki to get an overview of dark matter, and then for laughs I’ll refer you to my post on how Conservapedia calls dark matter a liberal pseudoscience. 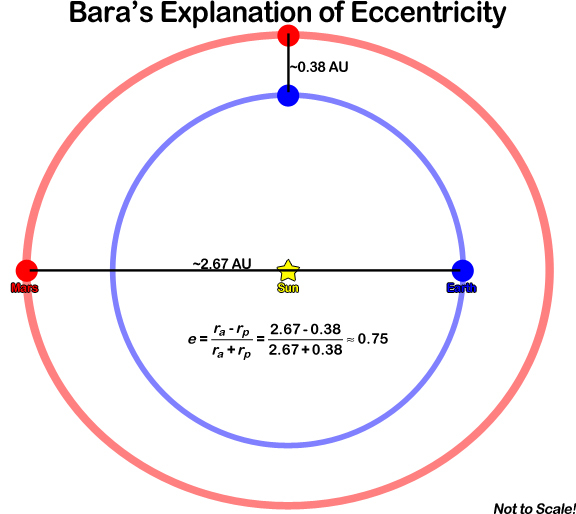 As I noted with the galactic alignment, at the very least, Bara needs to provide evidence at least as convincing as the conventional explanation for his ideas to be even considered. Though I guess you can always claim “God can do anything” (by definition, right? ), but that’s not science. It seems fitting that the section after I talk about Bara’s claim that is summarized as “scientists don’t know anything,” that I should come to this last one about ellipses that shows Bara knows less than the average middle school geometry student. I discussed this with Expat in the podcast, but it really bears repeating here, with diagrams. 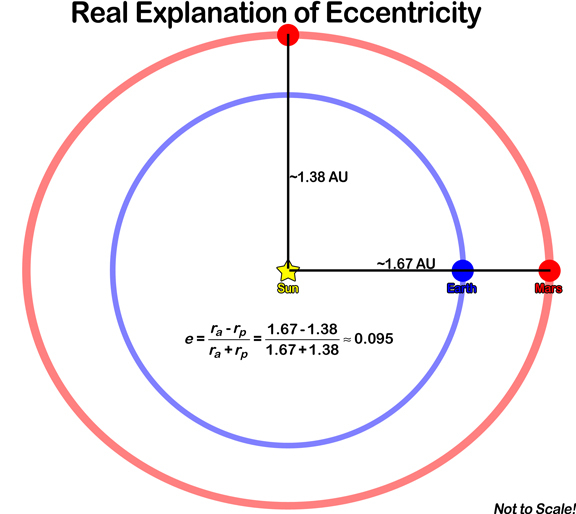 It’s really simply incredibly stupid of Mike to claim that Mars’ orbit is highly eccentric because it comes as close as about 0.38 A.U. (“astronomical unit” is the distance between the sun and Earth) but goes as far as 2.67 A.U. (Actually, in fairness, the numbers that he gives equate to 0.37 A.U. and 2.68 A.U. ; he and I rounded slightly differently.) Therefore it’s an eccentric orbit that’s evidence for his fission model of solar system formation. The problem here, for those who didn’t listen to the podcast or don’t remember their middle school geometry is that you measure the long and short axis of an ellipse from the center of the ellipse. Not some crackpot arbitrary point inside or outside of it. In this case, the sun is one of the foci of the ellipse that is Mars’ orbit. The sun is one of the foci of ALL solar system objects that are in orbit. Earth is not. Measuring your axes from Earth is just stupid. It’s made up. It makes no sense. It has to be one of the stupidest things I’ve ever talked about on this blog, and that’s saying a lot. It’s as though Bara missed math classes after 5th grade, missed the Copernican Revolution that started over 500 years ago, heliocentrism in third grade, and then he simply lies about it that he didn’t claim he said what he did, and then he makes the original claim again. Bara 0, Science 5. Though I’d like to count this last point more as ∞ because of its shear stupidity, so … we’ll just wrap it up with Bara 0, Science ∞. This was a long post and took me over two hours to write. There’s a lot in here. I return, though to what I wrote in the background on the man. I think he is anti-science and is so clouded by his sense of new-ageyness that he clearly refuses to admit that he may be wrong about something or that the conventional explanation is real. His many claims that are related to astronomy are, well, many. I’ve gone over six in this post in some detail. Every single one is wrong. But when challenged, as was clear in my interview with Expat, Bara goes on the attack and defense, lashing out at the accuser, calling them a stalker, crazy, obsessed, etc., that nothing he said is wrong, and then refuses to address it in any way. From a psychology standpoint, it’s quite interesting. From an intellectual standpoint, well, there simply is none. There is no sense of intellect there that can be addressed. Mercury’s Uniqueness Revealed by MESSENGER: Does It Mean a Recent Creation? An interesting thing that happens when you’re defending your thesis and consequently not blogging for a few months is that other blogs can crop up that tend to cover similar material. In this case, there is a blog entitled, “Eye on the ICR” run by a high school student from New Zealand. Ah, if only we had blogs back when I was in high school … though I probably wouldn’t have been writing against creationism as my topic of choice. Whatever … he’s still a high schooler, I’m a Ph.D. astronomer. Hopefully I can add something to the conversation he started. We’ll see. This post is yet another about the “science” writer, Mr. Brian Thomas, and in this case his ICR article, “Messenger Spacecraft Confirms: Mercury Is Unique.” First off, the name “MESSENGER” is an acronym that stands for “MErcury Surface, Space ENvironment, GEochemistry and Ranging.” In other words, you need to capitalize it, unless you’re writing for the BBC which doesn’t seem to capitalize acronyms. Ah, we’re off to a good start. After the title, Mr. Thomas does his normal routine of spending a paragraph or two (in this case one) giving some very brief background about the subject. It’s okay, something you’d get in a normal news article but which most third graders know. Then we get to the line that those who are familiar with young-Earth creationist (YEC) writings know is the kicker: “Mercury possesses unique characteristics … clues point in the opposite direction to what astronomers expected.” Yes, that’s right, because something is not exactly as a model predicts, God did it. That’s basically what the remaining six paragraphs say. For my very loyal readers (hi Joe, Susan, Karl), you might remember that I discussed Spike Psarris twice (here and here) in ripping apart a 12-minute video segment he produced on why Jupiter needs God to have created it 6000 years ago. In skepticism, we often give YECs and Intelligent Design (ID) proponents the proud title of the best examples of quote miners. In this case, a creationist (Brian Thomas) is quote mining another creationist (Spike Psarris). Spike does indeed say that in his 2004 article. But he actually goes on to explain that we have a perfectly reasonable natural model for how Mercury got as dense as it did. Granted, Spike in his own special way then tries to rip it to shreds through an argument from personal incredulity, but that’s somewhat beside the point for this post. For those wondering, the “evilutionist” way of explaining this is that Mercury was involved in a massive collision early in its history that stripped away all of its crust and a large portion of its outer mantle, leaving behind the core of an originally much larger planet along with some mantle material. We know that these kinds of large collisions happened in the early solar system, there is an enormous amount of evidence for that, so it is perfectly plausible that this is what happened on Mercury. Despite what Spike says. Paragraph four of Mr. Thomas’ article states, “assuming that the planet formed naturally and close to the then-forming sun, lighter-weight elements like sulfur should have been ‘lost in space,’ … and yet Mercury has ‘high levels’ of sulfur.” Hmm. I guess that means evolution can’t be true and God created everything 6000 years ago. Yes, one of the interesting discoveries of MESSENGER is that it detected high levels of sulfur on Mercury. And yes, Mercury likely formed close to the sun, well inside the temperature line where we would expect lighter elements and molecules to be gaseous and not condense and be incorporated in large quantities into forming planets. Except, well, obviously they did. And there are numerous ways of getting them to these planets — remember I talked in the last section about lots of massive collisions? This is the way we think Earth got most of its water. In the Space.com Q&A, Solomon commented, “I’m now fascinated by the magnetosphere.” And it is small wonder that he is, because for many years the “dynamo theory” (which has since been shown to be false) was the only explanation offered for magnetic fields on rocky planets that are supposed to be billions of years old. However, this theory requires a molten magma core. And Mercury is so small — only slightly larger than the moon — that its core should have cooled into a solid millions of years ago. Therefore, it should not have a magnetic field at all … . And yet it does. Messenger’s new magnetic measurements fail to explain why Mercury has a magnetic field. Instead, they add ammunition against a naturalistic origin for the planet. Scientists did not expect to discover that Mercury’s magnetic field is lopsided, but the 2011 Messenger data showed that it is stronger in the north than it is in the south. What natural process would cause that? I actually want to disassemble the second part first, in that the “magnetic measurements fail to explain why Mercury has a magnetic field.” As a science writer, Mr. Thomas should know that measurements (data) do not explain anything. Data are data (“data” is the plural form of “datum”). They have no explanatory power in and of themselves, the data simply are what they are. It is how the data fit into models that will then support or refute them. Further, on the lopsidedness of the field. I know I’ve said this before, but for new readers and returning ones who like the reminder: That’s what science is!! We want to find something we can’t immediately explain because that means that we can then go try to figure out why it is the way it is! It’s only YECs that don’t want anything that doesn’t fit with their own Goddidit model because that would mean that, gasp!, maybe goddidn’tdoit. In fact, Mr. Thomas, in what is obviously meant to imply that goddidit, asks the exact question that I’m sure that mission scientists are trying to answer: What process causes a lopsided magnetic field? Okay, back to the first paragraph quoted above. I’m not even sure I really need to go into this too much. Suffice to say, yes, the fact Mercury has a strong magnetic field was a surprise when it was discovered, and it is actually one of the main questions that drove the MESSENGER instrument suite choices that will try to gather the data that will be used to test and further develop models to explain why it has an active magnetic field. Obviously, ongoing scientific research is just too much for Mr. Thomas to handle, though, because he clearly wants these observations to force us evolutionary astronomers (I still don’t understand what evolution has to do with astronomy) to throw up our hands and admit that his God did it. Oh yeah, and the whole “dynamo theory which has since been shown to be false” is him blowing out his you-know-what. That’s about the only outright lie I came across in this article. Mr. Thomas, please, do your homework next time. And by that, I mean read something other than the bible or Spike Psarris. But, I suppose when you’re content with a god of the gaps outlook on everything in life, actually learning something new is not important. Oh, and in all seriousness, check out the Eye on ICR blog if you like reading this kinda thing. A high school student willing to take on the ICR, even if it’s just in a blog, and point out their foolishness is pretty cool. When I was in high school, the only creationists I confronted were classmates (ah, I still remember 7th grade when I made a girl cry just by saying that we didn’t know why the Big Bang happened, but who created God?). This post is in regards to the Institute for Creation Research’s January 13, 2001 program entitled, “Sun, Moon, & Stars.” You can listen to the audio here. The basic premise behind this episode of ICR radio is to talk about the sun, moon, and stars, and to raise enough questions as to lead a listener to think that these “three” celestial items prove the Universe was created. The first train of thought has to do with one of the first real scientific ideas of how the solar system formed: The “Nebular Collapse” theory that was thought of by a fairly famous mathematician named Laplace. The Nebular Collapse theory’s basic premise is that a large cloud of dust and gas would collapse, the main center of collapse being where the star would form, and other points that started out as higher density eventually forming planets. The ICR episode goes on to say that this is still the basis for how we think solar systems form today, which is true – it is the basis for it. However, the program then goes on to discuss the debate that came to a head in the 1920: Were “spiral nebulae” actually nebulae in our own galaxy that were in the process of collapsing into solar systems, or were they actually outside of our galaxy, being their own “island universes.” The answer turned out to be the latter, when Edwin Hubble (you may recognize that name, there’s a fairly famous space telescope named after him) discovered individual stars in the “Andromeda Nebula,” thus proving that it was not a collapsing solar system. As far as I can tell, the only purpose of bringing this up is an ad hominem attack on Laplace’s Nebular Collapse theory: Because Laplace was wrong about these galaxies being nebulae, his whole theory of solar system formation must be wrong, which means that since it forms the basis of our current theories, they must also be wrong and so we have no idea how solar systems form. If you listen just a little further (starting at 3 min 50 sec), you’ll find that my supposition (which I made before listening to the rest of the episode) is correct: They use it to cast doubt upon our current theories. For example, he points to Venus’ spin. He correctly states that Venus revolves “backwards” on its axis, which “shouldn’t” happen according to the Nebular Collapse theory. Well yes, that’s true, everything should be orbiting and spinning the same way. But we can fairly easily explain it by a giant asteroid impact early on in the solar system’s history. In addition, there are other possible mechanisms for flipping Venus over, none of which involve God. The alternative that they imply but don’t explicitly state, of course, is that they want the listener to think that God must have created Venus just as it is. But there’s no way to test that, no way to model it in a computer, and no way to make predictions based upon it. In other words, it’s not science. 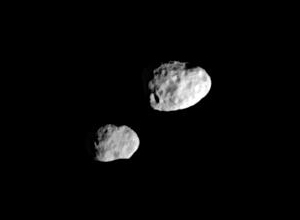 Next up, around 5 minutes into the program, they have Wayne Spencer talking about Saturn’s “Dancing Moons,” Janus and Epimetheus. What’s intriguing about these two moons is that they are separated by only about 50 km from each other in their orbital distance from Saturn, which is smaller than many large cities. And, every 4 years, they swap orbits. Wikipedia actually has a decent section on this. Wayne says the fact that they don’t collide must be evidence that God Did It. However, computer modeling of the break-up of a large object and then what would happen to the fragments show that this kind of thing really can happen under the normal laws of physics and can remain fairly stable, again, not needing the Hand of God. He then makes a side-note about how there are lots of surprises out there that we wouldn’t predict based upon a naturalistic worldview. This is correct. And that’s what makes science interesting: We’re always finding things that we can’t explain at that time, and then we work to try to understand why it is the way it is. The broadcast then introduces Donald DeYoung (about 6.5 min. in) to discuss that ocean circulation is largely due to the moon creating tides, this being essential for the ocean’s health and that we require the ocean to be healthy for life, and without the circulation there would be no oxygen which he then equates with air for us to breathe. This goes from true to possibly to wrong. Yes, the oceans get stirred up quite a bit through the tidal effects the moon has on Earth. Maybe this is a requirement for life, but it’s unlikely because there are other mechanisms for circulating the water, such as winds as well as the simple rotation of the planet. There could still be plenty of biota in the oceans without the moon, it just may not flourish as much. And as to oxygen for us to breathe, this is not correct, for land-based plants also make free oxygen, not just ocean plants, and if there weren’t oxygen in the atmosphere for us to breathe, we may just as well have evolved to take advantage of some other gas that was plentiful in the atmosphere. They then go on to discuss the moon’s stabilizing effect on our axial tilt, also known as obliquity (presently at the oft-quoted number of 23.5°). This is true – Earth’s tilt changes only by about ±1° because we have the moon helping to stabilize us. Mars, without a large moon, wobbles chaotically ±5-10° on the “short” timescales of millions of years, and between 0° to nearly 90° on much longer timescales. This ensures that our seasons are fairly steady and we don’t have the kinds of temperature extremes over various sections of the planet that we may otherwise have. It is entirely possible that life at our complexity could not have evolved on a planet with the kind of obliquity that Mars has. But this does not mean the moon was created — in fact, one could just as legitimately ask why (a) g/God didn’t create us on a planet WITHOUT a large moon for stabilization, just to show that s/he could? After this, the program reverts to standard creationist arguments that don’t really have to do with astronomy, so I will end this post here.